OZ has started to bring the former Alliance Space Army, scattered at each La Grange point, under control and also steadily increases its power in the colonies. The space fortress Barge is a symbol of that power. But OZ does not show the entirety of this power to the citizens of the colonies; rather, it shows another face. 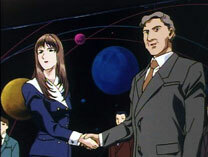 Substituting the former Alliance, the senior major Lady Une, as commander of the space army, forms friendly relations with each delegation of the colonies, one after the other. Together with the feeling of liberation, stemming from the suppression of the Alliance's army, OZ's new system is slowly but surely accepted. "In order to coexist in peace not only in the colonies, but in the entire Earth Sphere, the cooperation of everybody is needed now. However, unfortunately, among the colonies there is still the tendency to cling to past history, in which OZ has made mistakes, and therefore to look on OZ with doubt. But I do believe that one day, I will be able to greet the day when OZ's efforts will be understood." Lady Une, with her hair down, shows the representatives of the Area D in the L2 colony cluster a friendly smile. These days, Lady Une continues her life of making round trips between each colony cluster and the Barge. As commander of the OZ space army, there are many things she is supposed to do, like clearing out the scattered remains of the former Alliance, removing the space mines, giving orders to the Gundam engineers and additionally searching for the Gundam pilots who have taken off from Earth. On top of that, meetings with the delegates from the colonies are held almost every day. "We think so too in this respect. We will persuade each colony with all our might." The delegate Ted Narita makes a face, which makes his already serious expression behind his glasses seem even more serious. 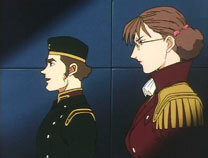 The delegate to his side nods at Narita's words and then complains to Lady Une. "But we have no way of facing violence. As you know, the colonies are an unstable world. System errors aside, if there's an attack, the citizens are facing death within an instant." Even things such as gravity, air and water, which are enjoyed on Earth and taken for granted, must be manufactured artificially in the colonies and made to circulate. When irregularities occur in this system, it becomes necessary to flee to designated shelters. The fear of facing this type of disaster has permanently settled in the hearts of the colony citizens. However, can they cope with unexpected damage from a battle? When a beam cannon opens a hole in the wall, what will happen? This is the reason why the colonies could not oppose the Alliance's military power with a military power of their own. The fear made them hesitate to take up arms. This has also been at the origin for the rise of Heero Yuy's peace ideology of renouncing arms. "For this, there's OZ. As long as we from OZ are around, justice will certainly be served." Faced with the delegate's point, Lady Une answers with a smile, as if to calm down the delegates. "If Major Lady Une says so, I'm relieved." "When there will be peace in space, even people who harbour doubts against OZ will certainly wake up." In that moment, Lieutenant Nichol comes walking briskly from behind and addresses Lady Une. "We have captured the item in question." Nichol says this while chosing the words carefully, in order not to give out anything to the group of delegates. Then he continues "Major, please return to the Barge." However, Lady Une tilts her head in surprise, and asks Nichol again. "It's an instruction from his Excellency Treize." Feeling slightly impatient, Nichol adds this at the end. Lady Une murmurs this name as if veryifying it. Slowly, a sharp light comes back to her eyes. "I will return to the Barge." As she announces this to the group of delegates, the soft tone has disappeared from her voice. Having returned to the Barge, Lady Une changes into her uniform, pins up her hair and enters the command room. With the glasses, her face has already regained its usual high-handed attitude. "There is no mistake. It's the HLV which left from the Singapore base carrying a Gundam on board." Nichol answers to Lady Une's question. "The Gundams are an evil which harms the colonies. As a symbol of evil, they have a great utility value. Send out the Taurus! Catch him!" "What should we do with the pilot?" "That depends on his looks." At Lady Une's answer, Nichol asks again. "If he's ugly, let him live. If he is a person who causes people to feel pity, kill him. Somebody who could become an obstacle to the reformation of people's consciousness is not needed now." "Was that to let him live if he's ugly?" Nichol aks again with open bewilderment. Lady Une answers him with a sudden smile about her mouth. Nichol's expression becomes even more bewildered, as if he did not believe Lady Une was capable of making a joke. Thirty minutes later, a formation of three manned and three unmanned Taurus is heading towards the HLV. "It's confirmed. This is a HLV which has departed Singapore with a Gundam on board." "No energy reading. It's a miracle that it has come flying up to this point without refueling." "There's the possibility it's not manned." "I don't care. The order is to collect the suit. Let's pull it to the colony C102 as it is." After the radio contact between the commander and his subordinate, two manned Taurus approach the HLV with the intention of attaching a magnetic wire. In that moment, the outer wall, where it touches the Taurus' arms, becomes all red and dissolves. From the interior, an energy bundle stretches out and cuts through the outer wall, cutting the Taurus in two. One Taurus explodes with a flash of light, and instead of it appears from the inside of the HLV the black mobile suit Deathscythe. "I am so grateful for being welcomed by the new model." In the cockpit, Duo spits this out with difficulties. Because it took him a few day to come here and he did not have enough provisions either, his physical strength has been worn out. "However, any guy who gets too close out of sheer carelessness.... dies!" Together with the shout, he pushes the control lever away. 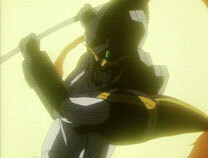 Deathscythe flashes the beam scythe and cuts down another Taurus. Letting his eyes run alternately over the radar and the monitor, Duo searches for sightings of the enemy. 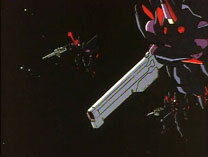 Three black Taurus fly into the surroundings of Deathscythe and come attacking with beam cannons. Without being able to react, Deathscythe is hit by the beams. As the beams make the armor evaporate, the accompanying shock wave hits Deathscyhe and Duo is rocked in the cockpit. Duo emits a groan. The reaction time of the enemy is quicker than Duo anticipated. He doesn't know that the enemies are unmanned mobile dolls. Additionally, there's the important matter that Deathscythe has not been adapted to space specifications. That's why there are not sufficient Vernier engines installed to control the suit's posture. An anxiousness like he has never felt on Earth assaults Duo. If he defeats this mobile suits, what will become of the propulsion towards the colonies. In this battle, he starts to think like this. It cannot go well. Then, the situation he has feared arises. The beam scythe has no more energy. As if to follow it, the monitors black out. "Tsk, the energy left is zero. Deathscythe is dead. And I don't have long either...."
Deathscythe has used up the ammunition in the Singapore base and also the energy for the most part. It has no weapons. Besides, the life-support system has also come to a stop and with only the oxygen inside the suit, he has probably around thirty minutes. "But I will not die for nothing!" Duo lets a panel to his left side slide open. The red button of the self-destruct mechanism appears. "I don't want to imitate Heero... but... I'll go to hell together with the God of Death!" After shouting this, he bangs his fist against the button. But no alarm sounds and the emergency light is not switched on either. Getting impatient, Duo swings his arm again. However, without any reaction. "No luck. Even the self-destruct mechanism is done for. No, I am lucky...."
Slumping his shoulders, Duo settles in his seat. Already the monitors have become pitch dark and nothing is displayed on them anymore. He doesn't know what is happening on the outside. In that moment, the vibrations indicating that something has pushed against Deathscythe's armour with a bang are being transmitted. The Taurus may have attached a wire to Deathscythe. Having murmured this, Duo closes his eyes inside the helmet, as if he didn't care anymore. In a school in the Area C of the L1 colony cluster, Heero investigates the situation surrounding the colonies as he leads a student's life there. Lady Une, after the space army has been left to her, is successful with her conciliatory measures in the colonies, and she has certainly widened the supporting class within the citizens of the colonies. Especially the education for young people treats OZ as liberator from the oppression of the Alliance, and the movement saying to please not regard it as a military organization is conspicuous. "The year is After Colony 175. No major incident in the colonies.... Even the story of the assassination of the leader Heero Yuy has been deleted. OZ's methods have not changed either." 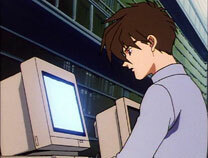 Heero is sitting in a library before a terminal used for looking up information. He murmurs this as he sees the history information appearing on the monitor. "It seems that now even the bookburning is very easy as long as nobody knows about it." If the database in the main computer is rewritten, the information going to all computers changes. It's possible that the ruler only passes information to the people which has been controlled. The same could be said about the Gundams. Only information which is convenient for OZ is leaked to the citizens, who are unaware of this. Who is the true friend of the colonies? In the meantime, the citizens of the colonies have been put in a situation where they don't even know this. 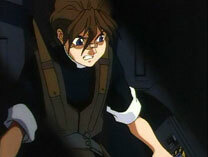 After getting up from his seat, Heero leaves the reading room and turns towards the vestibule. In that moment, as he passes the lobby, a voice reaching his ears stops his steps. "Following the arrest of the fanatical scientists, who wanted to disrupt the peace between all of mankind in the colonies and the Earth Sphere, one of the Gundams, which have executed numerous destructive actions and threatened the peace, has been destroyed by a troop of Taurus. Also the pilot has been arrested." It's the announcer of a news programme. 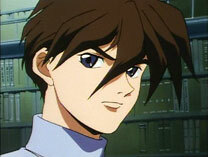 Quickly running his eyes over it, Heero looks at the static image projected onto the screen and narrows his eyes. It shows a boy in black clothes as he is held by OZ soldiers on both sides and taken away. "The pilot's origin is under investigation. The authorities on the colony C102 have published a commentary that, with this as a lead, OZ will devote all its strength to the destruction of the rebellion's elements and its organization. Highly valuing the present activities of OZ, the authorities will now endeavour to maintain the relationship of mutual cooperation." Looking at Duo's figure, Heero admires inside himself the cunning of OZ. Everything has been thought through, up to the way the photo has been chosen. As if not to make people feel pity, they took a picture as he is yelling at the OZ soldiers with an especially fierce face. If he saw it himself, he would probably grieve over it. Nothing can be felt about his usual cheerfulness. Heero can estimate what measure OZ will take now towards Duo and Deathscythe. It's going to be a public execution. It's not going to be warning. As an enemy threatening peace, he is killed instead of OZ. By doing it like this, the enemies of the colonies cease to exist and the will of the colonies are likely to be united. The present situation puts us at a disadvantage. I will remove an even more unfavourable factor. After Heero has sent another sharp look at the picture of Duo and Deathscythe, he leaves the lobby.